1. A pigtail of one-fourth to one-half inch (three to six twists) should be made at the end of the wiring. This pigtail must be bent back or under to prevent it from becoming a snag. 2. The safety wire must be new upon each application. 3. When you secure castellated nuts with safety wire, tighten the nut to the low side of the selected torque range, unless otherwise specified. If necessary, continue tightening until a slot aligns with the hole. 4. All safety wires must be tight after installation, but not under such tension that normal handling or vibration will break the wire. 5. Apply the wire so that all pull exerted by the wire tends to tighten the nut. 6. Twists should be tight and even, and the wire between the nuts should be as taut as possible without being overtwisted. COTTER PINS Use cotter pins to secure bolts, screws, nuts, and pins. Some cotter pins are made of low-carbon steel, while others consist of stainless steel, and thus are more resistant to corrosion. Use stainless steel cotter pins in locations where nonmagnetic material is required. Regardless of shape or material, use all cotter pins for the same general purposesafetying. 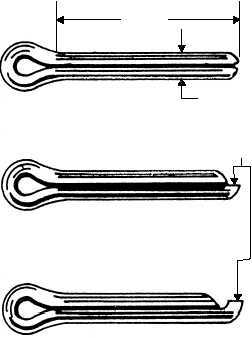 Figure 5-27 shows three types of cotter pins and how their size is determined. NOTE: Whenever uneven-prong cotter pins are used, the length measurement is to the end of the shorter prong. Cotter pin installation is shown in figure 5-28. Use castellated nuts with bolts that have been drilled for cotter pins. Use stainless steel cotter pins. The cotter pin should fit neatly into the hole, with very little sideplay. The following general rules apply to cotter pin safetying: ! Do not bend the prong over the bolt end beyond the bolt diameter. (Cut it off if necessary.) ! Do not bend the prong down against the surface of the washer. (Again, cut it off if necessary.) ! Do not extend the prongs outward from the sides of the nut if you use the optional wraparound method. ! Bend all prongs over a reasonable radius. Sharp angled bends invite breakage. Tap the prongs lightly with a mallet to bend them. Q5-11. What is the purpose of safetying aircraft hardware? Q5-12. What is the most common method of safety wiring? Q5-13. What are the two methods of safetying turnbuckles used by the military services? Q5-14. What type of cotter pin should you use when nonmagnetic material is required? WASHERS LEARNING OBJECTIVE: Recognize the two primary functions of washers as used in aircraft/engine construction. Washers used in aircraft structures may be grouped into three general classesplain, lock washers, and 5-19 ANF0527 UNEVEN PONG OPTIONAL DIAMETER LENGTH Figure 5-27.Types of cotter pins. ANF0528 PREFERRED OPTIONAL Figure 5-28.Cotter pin installations.